When organizations adopt a new practice model, many factors influence its success. 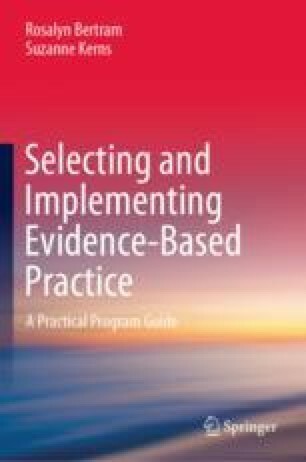 Implementation science provides frameworks that guide selection, installation, implementation, and sustainability of evidence-based practices. These frameworks describe critical components and drivers to guide development and application of leadership, organizational, and workforce competencies that influence effective service delivery. In this chapter, we present the frameworks of intervention components, implementation drivers, and stages of implementation as well as the importance of embedding high-quality implementation in facilitative contexts. Waters, T., Marzano, R. J., & McNulty, B. (2003). Balanced leadership: What 30 years of research tells us about the effect of leadership on student achievement. A working paper. Retrieved from https://eric.ed.gov/?id=ED481972.